I have been following both US – Rupee exchange rate as well as stock market, and it is quite obvious that both of them are inversely proportional to each other. If you see both the charts carefully, you will see that they behave exactly opposite. Lets take 2 data points – January 2008 and January 2009. In January 2008, the stock market had crashed after reaching a peek of 21000, during that time, the rupee rate has appreciated to 38 against the dollar, it was for the first time that rupee was so strong. 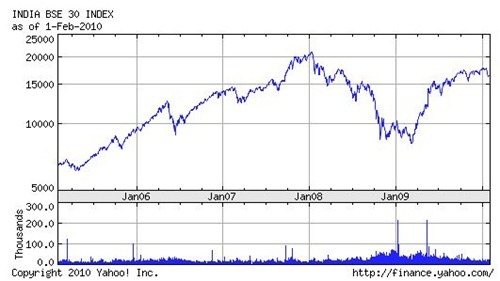 Now, 2008 was really bad for stock markets and in January 2009, the market reached its lowest close to 8000, from its peak at 21000 ! The rupee on the other hand had depreciated through out the year reaching a high of 52 when the stock market was its lowest. 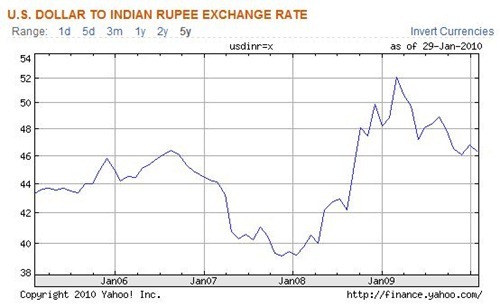 Since January 2009, the market is steadily moving up and so is the rupee getting strengthened. Now, the logic behind that is very simple – If the economy is getting stronger and growth rate is steadily moving upwards, the stock market is going to rise. The Macro economic value of country will increase and so will the currency !